Andy Peaks isn’t getting ahead of himself despite his AFC Rushden & Diamonds team hitting their first purple patch of form this season. Diamonds are now fully settled into life in the Evo-Stik League South Premier Division Central after they extended their unbeaten run in the league to five matches on Tuesday night. 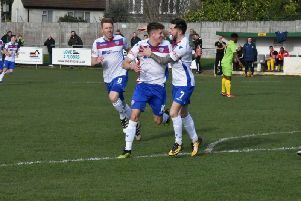 Goals from Ben Farrell, Declan Rogers and Tom Lorraine sealed a fine 3-1 success over Coalville Town at Hayden Road as Diamonds moved into the top eight of the table. Having been promoted from Step 4 last season, Diamonds now find themselves just four points off the play-offs after the first quarter of the new campaign. But Peaks insists he just wants his team to focus on picking up as many points as possible. “I am just enjoying picking some points up to be honest,” the Diamonds boss said. “We are testing ourselves against some big clubs and good teams and, at the moment, we are holding our own both home and away. “It’s a good league to be playing in and I just want us to pick up as many points as we can and see where it takes us. There is a change of focus this weekend as Diamonds entertain league rivals St Ives Town in the first qualifying round of the Buildbase FA Trophy. The two teams shared a dour 0-0 draw in the league at the end of last month and Peaks is now keen to see his team maintain their recent good form. “I want to keep the momentum, we have got into a good groove and we have a system which suits us,” he added. “There are players knocking on the door but out of respect to those who are doing it, it’s only right that they carry on. “This isn’t a game we are taking lightly. It’s massive for me and the club and I want to win. “We know what St Ives are like, they are a difficult team to play against. “They are always well organised, as we found out in the previous game, and they are hard to break down. “It will be a really tough match."